New Delhi / Gurugram, April 6, 2019 : According to CMR’s Annual 4G LTE Devices India Market Review Report 2018 released today, the 4G LTE devices shipments in India grew at 50% in 2018 YoY with shipments surpassing 200M units. 4G devices include mobile phones, tablets and data cards. In 2018, 4G devices had a 64% market share. While 4G LTE enabled mobile device shipments crossed 60%, the 4G LTE tablets accounted for 44% of the total tablet shipments. On the other hand, 4G LTE contributed for 100% of the data cards shipped in CY2018. In CY2018, LYF led in the 4G LTE mobile handsets with 33% market share, while Lenovo dominated the 4G LTE tablet market with 40% market share. 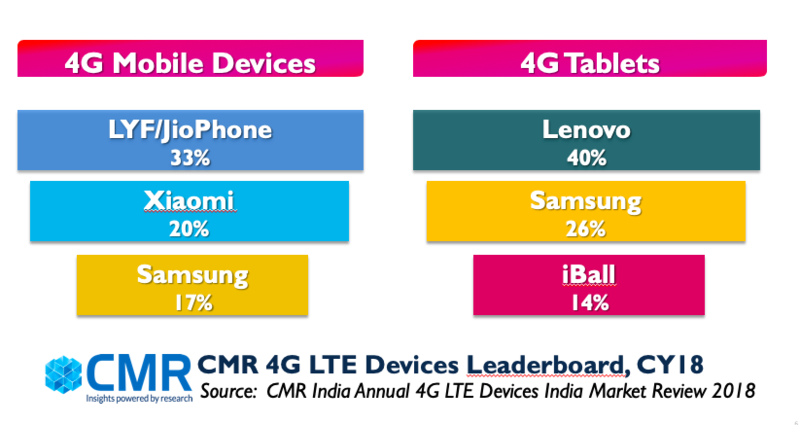 LYF is the only Indian brand in the leaderboard shipping 4G LTE mobile handsets. Over the next couple of years, 4G will continue to dominate India. CMR estimates point to 4G technology adoption potentially surpassing 80% by 2024. CMR anticipates a modest spike for 5G by 2023, with CMR internal estimates pointing to 5G smartphone shipments in India to top 140M by 2025. “At CMR, our internal research estimates point to the 5G enabled devices contributing to 3% of the total smartphone shipments by 2021, and potentially reaching 16% by 2025. The course of 5G in India will be driven by how Jio plays its cards,” added Prabhu.